Last night, we were supposed to have soup for dinner but both decided we needed something a little more substantial. Shrimp is such a quick, easy and delicious go-to meal for us. Here was our dinner. Toast up the corn in a frying pan with a little Olive Oil or Coconut Oil. Add shrimp and cook 2-3 minutes per side, add seasoning and lime juice. Mix Mayo and Sriracha in a separate dish. 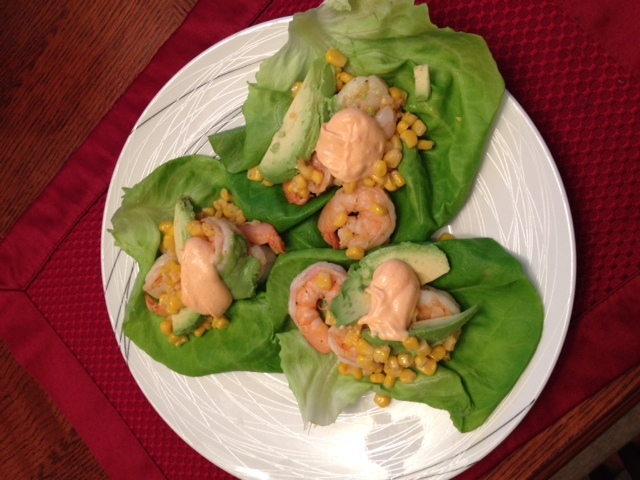 Put shrimp and corn in a lettuce leaf, top with sliced avocado and “fancy sauce”. This entry was posted in Uncategorized on February 24, 2014 by Danielle Laroche.